I’ve been slowly re-decorating and re-organizing my back entry way. I’ve already showed you the homework message centers and the backpack holders. My plan was to re-do my boys homework desk and I can finally say that it is finished. You may have missed my post on the homework desk from almost a year ago, if so you can view that post here. I put peel-n-stick cork tiles directly onto the wall, then painted the cork a barn red. and made some fun labels, slid them through my sticker maker and stuck them to the bins. The magazine boxes are from Ikea. I found the frame at a garage sale and spray painted it, then designed and printed the fun little saying and popped it into the frame. The star is from Target. Colored pencils, pencils and crayons are in these little tins that I got from Target, they were white and again, I decided to spray paint these guys too. That is my updated homework desk area. How about you? Do you have a specific homework area for your children? and the rectangular ones HERE. I've got a few different colors in the trellis design available for sale, both in circles and the rectangles too. Stop by my SHOP and check them out. Love the red - it looks great. I am very inspired to go and clean up my kids homework area. It looks great. Thanks for the inspiration. Currently we are using the kitchen table, but as my kids are getting older and they are getting more homework, I'm realizing they need a designated space for it. Thanks for sharing your ideas! I love the red cork board and the bucket with pencils and crayons. This seems like something that would be easy for kids to keep organized. I might have to work on the desk in my kids room now! Great space! Love that you attached the cork right to the wall. I love your site! 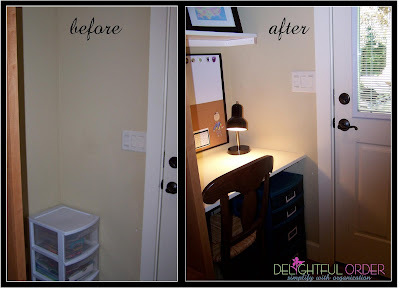 We have a homework area but it's not nearly this cute! It's a white desk from Ikea, that fit perfectly in the space between our Ikea Expedit entertainment center and the wall. We added a few floating shelves from Ikea above it and added a desk lamp, also from, you guessed it, Ikea! (I have a slight love affair with Ikea <3 ) This inspires me though to try and make it look more appealing! Thanks for all the great ideas!